Email is still a reliable force in digital marketing. It is important because it creates a fast reliable form of communication and easily accessible. It reaches Right the subscriber's inbox right away within minutes. • It is more personal & direct medium for communication. • Messages are delivered within seconds around the world. • It allows to save & keep a record of your communication. • Easy to send with no time bound. • You may attach files, documents, images, & other media to an email. • You can access your email from anywhere with Internet connection kept on. When you send an email to someone, your email signature—and its message—flashes in their inbox. Done right, this is a powerful persuasion tool. 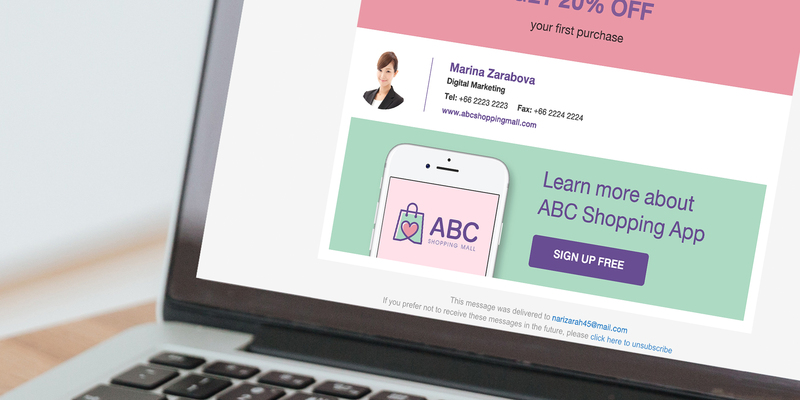 Here are examples for Email Signature that will get you clicks, traffic and leads. To show, don’t tell, this is one unwritten rule of email marketing. An example is a small gallery of images that show your product will build curiosity. It will give the people a glimpse of what you have in your social. An email signature can help marketers to drive more registration, attendance, and post-event follow-up. CTA in all the employees can result in additional, views, clicks and registrations. Your blog posts are a powerful place that you can leverage especially if it is related to the email subject. It’s like putting it out there in a subtle way for you subscribers attention. This is good if you are sending cold emails too. The subject line should relate to the email signature to gain more clicks. Ebook has always been the easiest way to provide consistent and meaningful value. It never gets old in reaching out to new prospects or customer to pass along helpful contents. This builds trust and credibility towards your audience. The email signature should stand and all everyone on your team is sharing the newest ebook. Include a bright and beautiful CTA under the email signature. Every person you need to send an email is a potential customer. It makes sense to include links to any promotion or discount. Give them the importance of showing them the upcoming sale or discount that they could not miss. The most important part of the of the email signature is the Call to action (CTA). This is the part where you want attention - it can be anything - a link to your ebook, blog or image gallery on social. You have to consider the design of the CTA to maximize the attention. You can user contrasting colors, banner, and buttons as seen below. Crafting altogether will give you a click-worthy email signature. How does your team qualify the leads? Aside from the triggered emails or phone calls, one to one email support is the most popular. Email Personalization is important in these emails including clear CTA for the next step to educate your audience and provide a way to lead them to the next stage. Create an email signature that has a relevant content to the right audience will lead to great things for your team. Mook is a Senior Support Specialist in Taximail. She provides technical assistance, service, and training to Junior Support Specialist. Solving clients problems in a timely and efficient manner is her strongest suit. She is fashion enthusiast and a frequent traveler.